Bitter, sweet, salty, sour. All of these are sensations foodies and beer geeks can relate to. What happens when you start talking about sound or sight. What defines flavor? Does taste define flavor or does flavor define taste? Get ready to enjoy craft beers from small and independent breweries along with a strategic pairing designed to heighten your awareness of everything that goes into why you taste what you taste in a beer or a pairing. 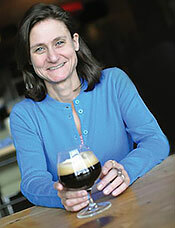 Julia Herz is the Craft Beer Program director at the Brewers Association, publisher of CraftBeer.com and a spokesperson for the Brewers Association. She is a BJCP-certified beer judge, an award-winning homebrewer, a Certified Cicerone® and a beer educator. Julia has been featured by The Splendid Table, The Food Network’s Unwrapped, CNBC’s Closing Bell, Good Morning America Live, is a regular beer blogger for HuffPost Taste, is co-author of the CraftBeer.com Beer & Food Course as well as the forthcoming book Beer Pairing. 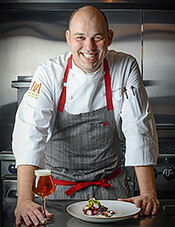 Chef Adam Dulye (pronounced “doo-lee”) is executive chef for the Brewers Association and CraftBeer.com. Dulye is a Culinary Institute of America graduate who has helmed kitchens with a craft beer focus from the mountains of Colorado to San Francisco, California. Dulye also oversees culinary side of SAVOR®: An American Craft Beer and Food Experience, Paired at the Great American Beer Festival®, and the World Beer Cup® and is co-author of the CraftBeer.com Beer & Food Course. This seminar will accommodate 150 people. Purchase Your Seat now.